Missing Info.plist key - This app attempts to access privacy-sensitive data without a usage description. The app's Info.plist must contain an NSContactsUsageDescription key with a string value explaining to the user how the app uses this data. Missing Info.plist key - This app attempts to access privacy-sensitive data without a usage description. The app's Info.plist must contain an NSCalendarsUsageDescription key with a string value explaining to the user how the app uses this data. Missing Info.plist key - This app attempts to access privacy-sensitive data without a usage description. The app's Info.plist must contain an NSMicrophoneUsageDescription key with a string value explaining to the user how the app uses this data. Missing Info.plist key - This app attempts to access privacy-sensitive data without a usage description. The app's Info.plist must contain an NSAppleMusicUsageDescription key with a string value explaining to the user how the app uses this data. Missing Info.plist key - This app attempts to access privacy-sensitive data without a usage description. The app's Info.plist must contain an NSSiriUsageDescription key with a string value explaining to the user how the app uses this data. I never requested to access any of the above in my app? We have been hit with this problem - Apple decided that we were accessing the photo gallery when our app does nothing with the gallery. We assumed that this was in a package were using, but could not find out which one. One problem is that apparently Apple do a static analysis of packages for access to these resources - whether your code exercises this access or not. In the end we just had to add a generic description in the appropriate info.plist entry. I think the description is only displayed if the app actually accesses the resource in question. Certainly our app never displays the message. You need to add these declarations to your app. That's a very weird! We don't use any of these features either and get the same list of missing keys. Siri and AppleMusic?! For real?! 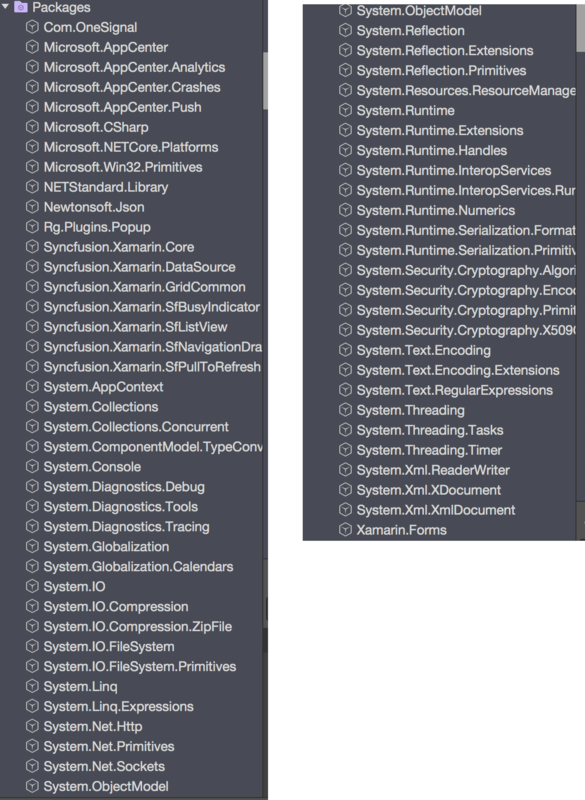 Is there any way to figure out which NuGet wants this? Can this be an issue of Xamarin.Forms package itself? What third party libraries are you folks using? @ChaseFlorell @JamesLavery - Do you know of a tool that we can use to do the static analysis ourselves, to preempt possible rejection? @JohnHardman That's a good suggestion. I don't know of any. It would be very useful so that, as you say, we can pre-empt any rejection. @DavidOrtinau - Any chance of adding a tool for iOS, that allows us to do this static analysis before submitting to the App Store?